Barack Obama has already had a walk-on role in a Spider-Man graphic novel but now the American president takes centre stage in a new series of comics that will see him facing off against the likes of “Boosh the Dim” and “Cha-nee the Grim”. 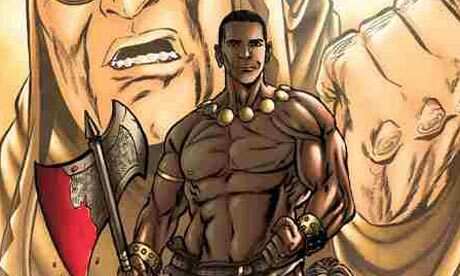 The series, which is set to launch in June from Chicago-based Devil’s Due Publishing, kicks off with “Barack the Barbarian: Quest for the Treasure of Stimuli.” Hugely muscled, wearing a fur loincloth and grasping a bloody battle axe in his manly hands, Barack the Barbarian is a “mighty hero”. He is the son of peasants from two different realms who is “destined to save the great republic of America and dethrone the overpaid despots of the time”. A particular foe will be Red Sarah, a comic book version of Sarah Palin who is pictured in a wolf fur cape, a fur bikini, and little else apart from her trademark spectacles. With a cast including Sorceress Hilaria and her demi-god trickster husband Biil, as well as Overlord Boosh, Devil’s Due promised that author Larry Hama, who has written for the GI Joe and Wolverine comic series, would “take political satire to a whole new level”. Readers can choose between two covers for the launch issue: Barack or Red Sarah. The second is a one-off comic. Set in an alternate reality, it sees Obama in less body-building form and deprived of his greatest strength, his oratory powers – he’s mute. America is in ruins: although the first wave of alien invaders has been repulsed, the starving populace is facing the coldest winter in a century. It falls to a former US senator “to rally a small construction unit in the frozen, haunted remains of Chicago. A man whose own destiny has been changed by the war: Barack Hussein Obama …” Drafted: 100 Days by Mark Powers is, according to its publisher, “a poignant look at a man the world never got to see achieve his true greatness when a race from beyond the stars drafted our planet into intergalactic war”.